Fr. Tom asks: Is it possible that the teaching of the Second Vatican Council about the ministry of bishops in the Roman Catholic Church is now being taught and practiced in an adapted and altered form in our Orthodox churches today? It’s a cogent and sober warning about the subversion of Orthodox ecclesiology that unfortunately has historical precedent. George Michalopulos examined the historical antecedents in his essay The Role of Metropolitan and Its Relationship within the Episcopate: A Reappraisal. Orthodox Christians devoted to accountability are surely aware that accountability in behavior cannot be separated from accountability in understanding since practice (praxis) is necessarily connected to vision (theoreia). This conviction inspires me, given the present state of things, to raise the following question: Is it possible that the teaching of the Second Vatican Council about the ministry of bishops in the Roman Catholic Church is now being taught and practiced in an adapted and altered form in our Orthodox churches today? Let me explain why I raise such a question. According to the Second Vatican Council of the Roman Catholic Church, following Vatican I and the Council of Trent, bishops are not organically connected to the specific dioceses in which they serve. They rather have their episcopal position and power by virtue of their personal sacramental consecration as bishops. They are, so to speak, considered to be bishops in their own right, and not in virtue of their ministries as heads and overseers of actually existing ecclesial communities to which they belong. As such, they can be moved about from church to church, and even function in bureaucratic positions with titles of sees that no longer exist and therefore without being the leading member of any particular church, and without having any flock at all. In this teaching and practice, bishops are not elected by the people of their dioceses and confirmed by all the bishops of the regional church to which they belong who, as brother bishops, affirm their election by first examining their faith and behavior, and then, when all is found to be acceptable, by consecrating them through the “laying on of hands.” They are rather appointed directly by the Pope of Rome. While their validity as bishops derives from their sacramental consecration, their legitimacy as bishops derives from their communion with the Pope, and their submission to him. Together with the Pope, and under his immediate direction, and in obedience to his unique authority considered to derive directly from God (whatever “politicking” may have produced him by vote of the qualified bishops in the college of cardinals, all Vatican-appointed men with titular pastorates of churches in the diocese of Rome), the bishops as consecrated individuals corporately form a “college” (collegium) that governs the universal catholic Church. And, as just noted, they do so by virtue of their union with the See of Rome and in submission to its bishop who is believed to be the unique “successor of Peter” and “vicar of Christ” and “supreme pontiff of the Church” who possesses direct and immediate episcopal authority and jurisdiction over every member of the universal church, including all the other bishops, and who also possesses the authority to speak infallibly on matters of faith and morals when speaking from the chair of Peter (ex cathedra Petri) not from the consensus of the Church (ex consensu ecclesiae) but rather in, by and from himself (ex sese). In this understanding, the bishops of a regional Roman Catholic Church like, for example, the RCC of the United States or the RCC of Canada, may for practical purposes form a local “episcopal assembly”. In the United States such an assembly exists. It is called The United States Conference of Catholic Bishops (USCCB). This conference elects its president and officers. It hires its employees and operates its offices. It organizes and coordinates certain ecclesial activities. It makes statements about church teachings and policies. It represents the Catholic Church in public life. And it leads and represents the regional Catholic Church as a whole, i.e. as a federation of Catholic archdioceses and dioceses in the USA. But this assembly of bishops has no ecclesial or ecclesiastical status whatsoever. According to Roman Catholic doctrine, it is not essential to the Church’s being and it need not exist. As the saying goes, it may be established for the church’s “well being” (bene esse) while being not at all necessary to the church’s “very being” (esse). It is not a canonical body. It is not an episcopal synod. It has no official place or status in the Church’s essential structure. It surely does not govern a self-governing church in communion with all other self-governing churches. It exists and operates exclusively under the direction of the Pope of Rome and the Vatican’s curial officers who are appointed by the Pope and answerable to him alone. The Orthodox Church, of course, has no infallible Pope who exercises direct and immediate episcopal jurisdiction over all the Church’s members in the world, including the other bishops. It has no bishop of any see that can speak in any way binding on all the faithful in matters of faith and morals. It has no curia. It has no magisterium. It has no college of cardinals. It has no international advisory council of bishops from around the world. It has no “ecumenical council”, or a council of any kind, that can be considered authoritative, still less infallible, before its decisions are taken and are universally accepted – or perhaps rejected — by all the churches that recognize each other as Orthodox. According to traditional Orthodoxy, using the celebrated third century formula of St. Cyprian of Carthage in his controversy with the bishop of Rome, Christ’s Church knows no “bishop of bishops” (episcopus episcoporum). The “episcopate is one” (episcopatus unus est) and all of the Church’s bishops hold the same episcopal authority and exercise the same episcopal service “in solidarity” (in solidum) with each other. The holy hieromartyr also teaches that the bishop of every church who makes St. Peter’s confession of faith and receives the Holy Spirit with the authority of “binding and loosing”, sits on the “seat of Peter” (cathedra Petri.) And St. Cyprian also holds, as proven by his famous letter 69, that the bishop in his own church does nothing by himself, but acts in everything in harmony with the church’s “common council” to which, as a member and head of the church, he is accountable for everything he says and does. These convictions, formulated so clearly and so well by St. Cyprian, are proclaimed and defended by all Orthodox doctrines and canons through the centuries. They are also demonstrated in Orthodox liturgy, including the rites of election and consecration of bishops. The Orthodox Church unequivocally rejects the teachings of Vatican Council I about the special position, prerogatives and powers of the Bishop of Rome. And today the Orthodox Church, it seems to me, should also reject the explanation of Vatican II about how bishops function in the Church, and how they and their churches are to relate to each other, including even to autocephalous churches and their primates. So what might a version of the Vatican II doctrine about bishops look like in the Orthodox Church? It might be that Orthodox “episcopal assemblies” will be established and organized not by an “apostolic see” with special powers, but by common agreement of the synods and primates of the world’s autocephalous churches. These “episcopal assemblies” will come into being in regions where no common autocephalous Orthodox church, with its synod of bishops headed by its episcopal primate, exists. The bishops of the autocephalous churches that are virtually all “national” or “ethnic” in character will control their bishops and dioceses in these regions even when the majority of their members are no longer of the ethnicity or nationality of the autocephalous church to which they belong. The names of the primates of the autocephalous churches will be raised in the liturgies of the churches that belong to them in the given region, either in all the churches, or just by the bishops, or just by the local primates. The synods of the autocephalous church will appoint the bishops and organize their dioceses in the region, or will at least confirm or reject local elections and decisions. And then, all the bishops in the regions belonging to different autocephalous churches will together form an “episcopal assembly” under the joint direction and corporate guidance of the autocephalous churches to which they belong led by the Patriarchate of Constantinople. Thus the autocephalous churches will act together as a kind of “corporate Orthodox papacy” governing the regional episcopal assemblies whose actions will be subject to their review, revision and even ultimate rejection if they consider that to be necessary. In this understanding, the regional “episcopal assemblies” will, for example, be allowed, and even encouraged, to undertake common missionary, educational and philanthropic activities, and to represent Orthodoxy in social and governmental activities. They may also be allowed to organize their dioceses as they see fit, and to care for all legal, fiduciary and financial matters as they decide. But only the synods of bishops of the autocephalous churches under the direction of their primates will ultimately approve or disapprove their activities. Only they will have authentic synodical status and genuine canonical authority. The local, regional assemblies of bishops will have none at all. They will not elect their own officers, but will be structured according to the order of the autocephalous churches. In the United States this would mean Constantinople would be first, then Antioch, the Moscow, etc. They will remain subject to the universal “collegium” in which they are included by virtue of their membership in the given autocephalous churches to which they belong. Thus the regional “episcopal assembly” will exist and operate solely within the areas and conditions that the universal “collegium” allows them. They will not elect their own bishops, at least not without approval subject to certain conditions of the autocephalous churches to which they belong. And they will certainly not be self-governing “sister churches” equal to and identical with all the others, however much it may be claimed that this is the ultimate goal of their existence. Given the origin and history of the Orthodox ecclesiastical “jurisdictions” in North America, and given the behavior of the autocephalous churches, and given the activities to date of the United States Episcopal Assembly and the relationship of its “member jurisdictions” to the old world patriarchates from which they originate, one can only hope that what we are now experiencing is not the working out of an “Orthodoxized” version of the Vatican II doctrine. Time will tell as the process goes on. And what will surely be told as time goes by is how our Orthodox bishops in North America and throughout the world understand themselves, and their episcopal service in their own churches, and their relationship to each other in their local regions, and their relationship to all the Orthodox Churches that make up Christ’s holy Church in the world as a whole. Leave it to Fr Hopko to crystallize the essence of the episcopate in an easy-to-read exegesis accessible to laymen. Having said that, it is vital that we take his words to heart and strive to make sure that this type of ecclesiastical careerism in which bishops are nothing more than mid-level managers transferred to and fro becomes extinct in the US. Father Thomas is right. If these “episcopal assemblies” become ends in themselves, rather than a temporary means toward the end of one, united autocephalous Church in this country, then it will all have been in vain. Only a local, self-governing Church (with its own Holy Synod and primate) will do. At this point, its impossible to tell whether something wonderful or something dreadful is being considered for the Orthodox in the Americas. Although, as Met. Jonah has stated, the OCA does not require all other jurisidcitons to submit to it, but join with it, it might end up that is what happens. May Bishop+Mark be the first of many more (although, he is not the first bishop to join the OCA Holy Synod). Preserve oh God our Holy Orthodox Church in America. Chris, I fear that Fr Hopko’s message is that significant parts of the Orthodox Church have indeed changed and adopted (de facto at least) this new model. I think you all are correct. There is an autocephelous Church in the Americas. If the Assemblies end up being a fraud then the only alternitive is for the Orthodox faithfull to seek out and be wed to Orthodox bishops. If they value unity then they should seek a transfer of membership to the OCA. I worry that mixing the episcopate of the OCA with the GOA will only secularize the Church as a whole by diluting the simplicity of true piety and apostolic zeal with political correctness, ethnic games, and programs. What I don’t understand is the vitriolic hatred of the OCA and rejection of the very idea of Autocephely by some, mostly Greeks, especialy the author of the blog, voices from russia. Do they actualy prefer the ethnocentric, non-apostolic, anti-missional, politicaly correct, secularized paradigm? I don’t get it. Ryan, the answer is “yes,” they do prefer the above. When the OCA declared autocephaly (or more accurately, was granted the same), the EP saw one of it’s most lucrative provinces suddenly at risk. Besides that, if you really look at the data (rather than the hyperbole) you will find out that the Ecumenical Patriarchate has really been on the verge of extinction for a very long time. The only sees with any life in them are the ones abroad..America, Australia etc. Then, along comes autocephaly and the threats to their financial lifelines – i.e. money from the US. Keep in mind that Abp Iakovos even attended the Ligonier conference in the early 90’s….sending shivers down the patriarchal spines. So what did the EP do? Fire Iakovos, followed by a new charter and ecclesiastical reorganization (metropolises instead of dioceses) designed to “divide and conquer,” i.e. to assure that no united action against the Mother Church could ever be taken, as well as to prevent the rise of another popular, local leader in the US. This has nothing to do with Christ, and everything to do with dinero. Dean, so, what is it the EP is buying with all that money? They have enough supporters I think to muddle along there are so few of them. What’s the money buying? Personally, I think they are underwriting the international space station….as a secure ejection pod. Although at this point, they may not be able to fill it! Seriously…i wish i knew. I’m sure there are lots of Swiss and Cayman Island accounts. Who knows..the Chambesy Center may have originally been just a cover. I’ve heard crazier. Come to think of it…you and I have SAID crazier! The “Last Days” require leadership and choices to be made. My body hurts from all of the inertia in the world. Guys, we really gotta keep our eye on the ball here. In the above essay, Fr Hopko has illuminated the proper Orthodox way of ecclesial governance. If we veer from this even an inch, then entropy and careerism will inevitably settle in. This was the basis of my inertia comment. We always tend to do well in the Orthodox Church when it comes to identifying the problem(s), we come up with very astute “stuff” – but when it comes to doing anything about it, more often than not, well, we actually don’t. I guess this is what Father Tom was talking about when pointing to “praxis” “theoreia” dichotomy we have created for oursleves. On another forum, I read that some faithful are actually jumping ship from a particular jurisdiction as a response to what Father Tom was talking about. I guess this is what we need to be doing. And in the end, if there isn’t something that resembles a unified Orthodox Church of Christ in North America, a Church body that glorifies and respects and gets along with God’s diverse creation (not one group trying to control or deny the other), then I guess it makes more sense for someone like me to return to the “ethnic ship” where at least I can bring to them what I learned in the “real world” and leave the rest to God. I am more mystified the deeper I look at these ecclesial presuppositions. 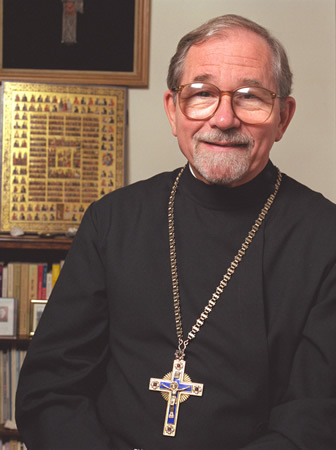 How can one assert that a potential bishop’s faith (theoria) and morals (praxis) must be “acceptable” as a requisite for elevation to the “Orthodox” episcopacy, and then EXPLICITLY state that “Orthodoxy” formally rejects any binding, authoritative basis for determing exactly what “counts” in faith in morals for the purposes of making such an assessment. It follows as a matter of LOGICAL NECESSITY that recognition of any given episcopal ordination as valid can never be binding on any of the faithful, since the very basis for such ordination (given Fr. Hopko’s ecclesiology) can never be explicated in a binding way in the first place. If the Russian Patriarch eventually affirms some joint reunion with Rome that claims to embrace a hashed out solution to the ecclesial role of the Roman Pontiff or the filioque, etc. what will happen? I’ll tell you what will happen. Entire sectors of “Orthodoxy” will judge the move as theologically “unorthodox” and will, on that basis, quite logically (again given Fr’; Hopko’s ecclesiology), no longer see the Russian Patriarch and those who CHOOSE (remember they are not bound) to follow his lead as “Orthodox”. In fact, even within the Russian Orthodox fold there would be many who would not hesitate to make the same charge against their own Patriarch. I remember reading a letter not long ago by Met. Zizioulas expressing frustration with just this sort of reality to his Patriarch. It is so common to use the phrase “The Orthodox Church” as if that were some recognizable concrete entity. But if “The Orthodox Church” is determined by “all the churches that recognize each other as Orthodox”, and if there is no intrinsic authority within “The Orthodox Church” which speaks with binding authority concerning that which should inform that “recognition”; then who can actually locate “The Orthodox Church” concretely? It is theologically impossible on Fr. Hopko’s account of ecclesiology – think about it. More and more this is looking to my like a smoke screen (no doubt unintentionlly) for something akin to the “invisible church” ecclesial mindset I left behind in Protestantism – an ecclesiology which ACCORDING TO ITS PRINCIPLES – theologically justified and perpetuated endless divisions. Orthodoxy is becoming a mess on the ground in terms of doctrine – specifically ecclesiology – as the current broo-ha-ha aptly reveals. For the first time, it is dawning on me that this state of affairs is actually logically underwritten by the type of ecclesiology which Fr. Hopko and other like him embrace. Its one thing if disunity arises from the vast panapoly of human sin; it is quite another if the formal principals of one’s theological paradigm necessitate – by their inner logic – the continuation and perpetuation of discord. I know I sound cranky, I just cannot be silent about this any more. The Catholics say that the role of Peter is a constitutive element gifted by Christ as a point of unity for His Church -maybe they are right. I am going to take Fr. Hopko’s advice and read Vatican II, but I fear with a different disposition than the one he intends. I also am aware that St. Cyprian said many other things that are not nearly as conducive to Fr. Hopko’s ecclesial outlook. I am sure Fr. Hopko is a holy man, and so I revere him and pray for him. Still, I cannot help but see the consequqences of his position as I have described. I am happy to be corrected or set straight in this. But then, isn’t that the problem, who has the binding authority to set me straight over against the venerable Fr. Hopko? Pray for me. I am not popping in to defend Fr. Thomas but to defend Orthodoxy. I think you are confused about two things that lead you to be frustrated at the Church’s self understanding and “messiness”. The Church cannot be anything other than self-defining, otherwise, it would not be the Church. There are infallible (or at least supreme) sources of Orthodox doctrine against which any bishop’s (or candidate for the episcopacy) beliefs and practices may be measured. These sources are Scripture, the consensus/writings of the Fathers, the decrees of Great and Holy Synods (i.e., those that are received and accepted over time by the Body of Christ), etc. It is the job of the bishops of the Church, in concert, and in corporately keeping with Tradition as it has been handed down to them, to be the judges of these matters. There is no disagreement within the Church that the Seven Councils are binding. Also, the Council on Hesychasm is considered a sound statement of Orthodox doctrine and normative. Reception is not an open ended process. Your other point of confusion is the self-defining nature of the Orthodox Church. If it is the Church of Christ (and it is), it cannot be defined by outside criteria. How could the Body of Christ be defined or delimited by anything exterior. It is imbued with the Holy Spirit. This is frustrating sometimes to the faithful since sometimes the Spirit takes time to work out complete clarity. However, the alternative is actually disastrous: Take for example the Ravenna statement which seems to say that the Orthodox Church is those churches in communion with Constantinople. This is not tenable in light of Constantinople’s previous lapse into h*resy during the Union of Florence. Nor could the Roman pontiff be a guarantor of infallibility. Pope Honorius was condemned by a council the Roman Catholic Church purports to accept. For a bishop to have power above and beyond the Church is impossible. The Church, the Holy Community, is the Body of Christ, not one bishop. Most prudent Catholics realize this but it bears stating, Rome is always only one bad pope away from becoming the Episcopal Church. What perturbs some people is that Orthodox ecclesiology presents them with a very stark choice – – the fundamental choice that all humans face: When you have an entity that is self defining and can’t be measured against any outside rule, you are confronted with the challenge of faith. You can choose to believe, or not believe, that those churches that organize themselves around the Apostolic Faith as defined by the Church itself and guided by the Holy Spirit are actually “The Church” or you can reject that belief. But if you are seeking something above or beyond the Church against which to evaluate it, you will be frustrated since only God Himself is above the Church, but He is also within it and reveals Himself through it. It really is totally one hundred percent up to you as to whether you believe a) that a particular entity is the Church and b) that you believe in what this entity tells you. There’s no evading that responsibility. Carl, you bring up interesting points but I don’t see how your observations invalidate anything that Fr Hopko says at least from an experiential perspective. Let us for the sake of argument accept your thesis, which I will choose to reiterate as there are certain logical inconsistencies in how the Orthodox Church defines itself. This includes Hopko’s exposition on the nature of the Christian episcopate. Let’s further stipulate that in a fallen world there is no thing or no experience that can logically be consistent each time and in each and every circumstance. Even with these caveats, the experience of history proves beyond a shadow of a doubt that Hopko’s analysis of the episcopate is more sane, rational, and administratively workable than the papalist model or the quasi-papalist model that is operative in the AOCANA. Quite simply, the idea that bishops are to be moved around like mid-level managers of a typical multi-national corporation is –and should be–anathema. Indeed, the idea of any local Church being subject to foreign potentate is (to put the best gloss on it) curious. For one thing, it makes a mockery of St Paul’s injunction that Christians were to “pray for the Emperor,” or St Peter’s dictum to “Fear God, honor the King, and love your neighbor.” If this is not the case, then Christians living in one country could hypocritically exempt themselves from paying taxes, serving in the army, etc., or conversely, a local bishop could preach subversion of the local authority because his “archbishop” who is the subject of another polity tells him to do so. I think we could all agree that these would be horrendous actions, morally unjustifiable and thus endangering our very salvation. Instead, consider the correct example of St Nicholas Kasstkin of Japan, who when the Japanese launched a surprise attack against the Russian Empire, exhorted his Japanese flock that they were to pray for victory for their nation. Nicholas was no pie-in-the-sky sentimentalist. This morally unjustiable action by the Japanese hurt Nicholas immeasurably. Regardless, Nicholas was not a Fifth Columnist, now was the church which he established a foreign agent. Nor would he permit it to be. Now compare this with the present situation in which a Greek-American bishop (let’s call him Bishop Esau) sells his birthright (American citizenship) for pottage (Turkish citizenship), for the express purpose of being eligible for election to the Ecumenical Patriachate. When this bishop is asked what he would do if the Turkish government asked him to speak against a parade of Greek-Americans. What answer can he give? Nothing coherent, just something mealy-mouthed. I don’t mean to pick on any particular colonial eparchy. Just merely point out the problems with having churches run in manifestly uncononical ways. Last year it was the GOA being subjected to the whims of Istanbul (which in turn were based on pseudo-science). Today it is the ecclesial atrocities being perpetrated by Philip who chooses to dress them up in incoherent and illogical arguments. Either way, things are bad and more importantly, they can’t get any better. On the one hand we can expect self-serving actions at worst, or an encroaching papalism at best. Neither option is palatable. Both are unChristian.